Compare what we have today to what was still around, and popular, a half century ago. I’m a big fan of technology, but I sure wish there were places where we could spend afternoons and evenings watching great movies on a truly gigantic screen. Once upon a time, that was the way people watched movies..in grand palaces. One such theater, a reminder of the era when Jamaica, Queens was one of New York City’s busier shopping districts, was called the Loew’s Valencia. Stars appeared on stage, and major motion pictures were shown to audiences who were grateful not to travel all the way to Brooklyn, Manhattan, the Bronx or Newark, where so many of the showcase theaters were located. Things have changed. So much about this particular theater has not. According to a spectacular article by a NYC movie location scout identified only as “Scout,” this 1929 movie palace is still standing–and it is in fabulous condition. You must read the article, if only to gaze at the pictures of this place. And, yes, you can visit. Today, it’s a Tabernacle. Designed by John Eberson, the Valencia was the largest theater in Queens, New York. It was lorious. For a look at the theater from street view with a competitive theater across the street (you cross under the subway to get there), click here. Inside, there are over 3,500 seats. The over-the-top decor was inspired by Mexican and Spanish baroque designs, with rows of cherub heads, elaborate tile work, swirls and flourishes (this from the New York Chronology). Loew’s Valencia is now part of the Registry of Historic Places. If you enjoy the magic of old theaters, the best place on the web to learn about them is Cinema Treasures. In its way, Cinema Treasures is the registry for all sorts of theaters, most of them long gone (cool thing: often, CT explains what happened and why). From its painted sky to the beautiful seats and elegant balconies, the Valencia recalls a time when movie-going was an experience. It may seem incredible, but there were a lot of movie theaters that looked like this…many just a few miles away from this one. The RKO Theater in Flushing was another large one in Queens was one of them. After a very long period of being ignored, the building site will become a high school. 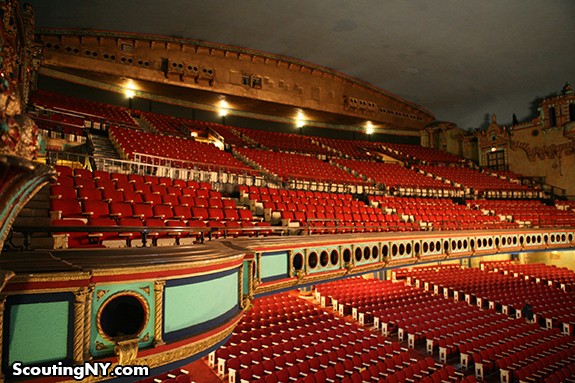 Some of the fabulous theaters in Newark, NJ (then, a vibrant city with an exciting movie, theater and nightlife scene) are still represented by their fading facades–and it’s worth a walking trip to get a sense of what was there so many years ago. We’ve gone from dressing up to sit in a huge, elegant dark room to watch big pictures of even bigger stars to the magic of watching movies on a little B/W box in our own homes to, nowadays, choosing from tens of thousands of films to watch any time, anywhere, just an instant after deciding what to watch. Along the way, we’ve lost a lot.